WFLHD used the INVEST Operations and Maintenance (OM) module to assess how DNP could improve the sustainability of its operations and maintenance activities. DNP contains six million acres of wild land and a single, 92-mile long park road. The park road is paved for the first 15 miles, while the remainder of the road is unpaved, surfaced with gravel. Private vehicle use past the paved section of the park road is restricted to administrative traffic, visitor travel via the transit bus service or tour buses, and a limited number of permitted special use vehicles. The Vehicle Management Plan sets a cap on the number of vehicles allowed on the restricted section of the park road to 160 vehicles per 24-hour period. Due to extreme temperature range and poor subsoil conditions, the park road requires intensive maintenance. Maintenance of the entire length of the road occurs from March to September each year, and the operational season for the road runs from mid-May to September, depending on weather and road conditions. The annual cost for maintaining the park road is $1.9 million, of which $1.3 million is dedicated to road maintenance beyond mile 15. Maintenance and operations activities include plowing, de-icing, dust suppressants, gravel reclamation, and gravel replacement. WFLHD and its contractor performed the INVEST OM evaluation. The team gathered information through a desktop review of documentation provided by DNP, NPS, and WFLHD, as well as a site visit and interviews with park staff. 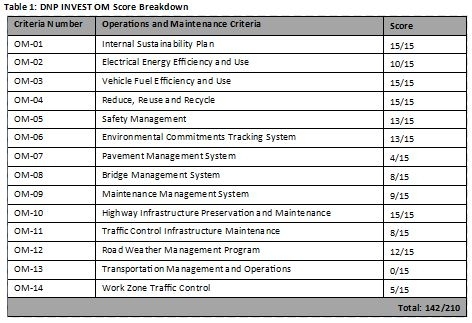 An initial version of the INVEST scorecard was presented to park staff, who reviewed the scoring and identified additional sustainability efforts that met the intent of the INVEST OM criteria. The project team then revised the scoring accordingly. After these revisions, DNP scored a total of 142 out of 210 possible points, for a platinum rating. OM-01 Internal Sustainability Plan (15/15): DNP received full points for this criterion due to the NPS adoption of the Green Parks Plan, a collective vision and long-term strategic plan for sustainable management of NPS operations. DNP tracks its progress towards meeting Green Parks Plan goals, and has published Climate Change Response, a document that details the efforts DNP is taking to monitor, manage, and adapt to climate change, and to mitigate its impact on climate change. OM-03 Vehicle Fuel Efficiency and Use (15/15): DNP strives to meet the NPS Green Parks Plan objective of increasing the number of high-efficiency and low-greenhouse gas (GHG) emitting vehicles in its fleet. The park’s fleet consists of 11 hybrid and three electric vehicles. DNP also uses “smart” vehicle plug-ins in winter and partners with other agencies to search for alternative fuels, including fish-derived biodiesel. OM-04 Reduce, Reuse, and Recycle (15/15): DNP received full points in this criterion through efforts to reduce waste generation in the park and divert waste from landfills. DNP has also been working with concessioner-owned and leased buildings to reduce waste. DNP aims to meet NPS goals to divert solid waste from the landfill through the sustainable management of materials used in operations and the use of locally-sourced materials in construction, as well as through increasing recycling. OM-07 Pavement Management System (4/15): DNP uses several NPS transportation management systems to track and monitor its roadway, including a pavement management system. It also has operating standards detailing the procedures to keep the road in good physical condition. However, the park has not set pavement system performance goals due to the impact of weather on the road and the fact that the majority of the road is gravel. It also does not conduct system modelling, scenario analyses, and trade-off analyses to identify and prioritize projects. DNP does not require this level of sophistication because it has a singular park road, rather than an integrated system of connected roads. OM-13 Transportation Management and Operations (0/15) DNP did not receive points for this criterion because the nature and utility of the DNP road does not require technological or operational management methods. Installing such tools would have no benefit to the park or operational quality of the park road, and would likely cause significant maintenance issues and costs. DNP’s high INVEST score reflects its commitment to implementing NPS plans and management tools related to sustainable operations and maintenance, as well as its mission of protecting and preserving the wilderness and the park for future generations. To more fully integrate sustainability into its operations and maintenance activities, DNP staff could document preferred procedures for times at which an immediate decision or approach is needed. This would help ensure that the most sustainable strategies are sought first, rather than reinventing the wheel or pursuing a strategy that has a lower upfront cost but is less sustainable. Through collaborating on the INVEST scoring with park staff, WFLHD identified many sustainable operations and maintenance procedures that DNP was already doing and will continue in the future. The INVEST scoring led WFLHD to recognize the importance of tracking and recording everyday sustainability efforts and preferred procedures in order to use sustainable practices to address road maintenance issues that need to be solved quickly. WFLHD identified INVEST OM criteria that may not be relevant for a rural park setting or for a nontraditional transportation agency, and recommended that future versions of INVEST have an option for excluding criteria that are not relevant to a particular agency’s context or sphere of influence.